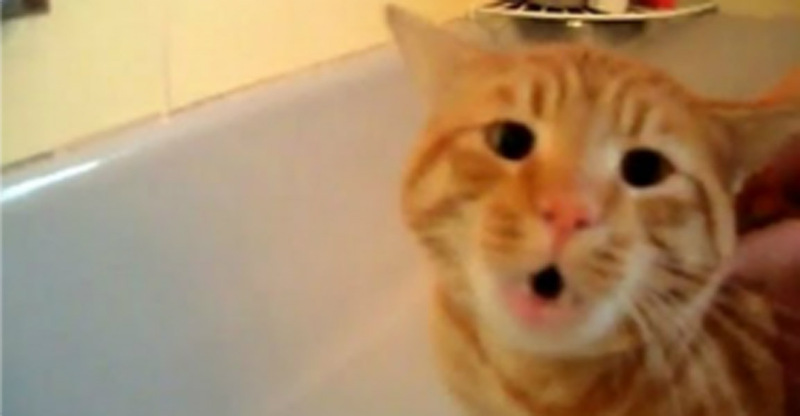 Home » Videos » She puts her cat in the bathtub. But the noise it makes at 0:07 suggests something else! She puts her cat in the bathtub. But the noise it makes at 0:07 suggests something else! Tigger the cat hates bath time. So much so that when he hears the bath water turn on, he starts to get upset. Although cats are naturally clean animals, sometimes they need a little help in the cleanliness department. Watch the video below to see what happens when Tigger gets near the water! Tigger's owner explains why the bath was needed: "At the time of the bath, Tigger was really dirty to the point that he was leaving traces of dirt and stains all over my bed, his bed and the dog's bed (he loves to roll in the dirt with my dog and lie under cars with the neighbor's cat!). You may think cats are clean animals and don't need baths, but Tigger really doesn't spend much time grooming himself for some reason. I decided to give him the bath this day because he came in with a couple of car oil stains on his back, which he was unable to clean himself, nor would it have been healthy for him to lick the chemicals off." Tigger was back his normal self shortly after bath time, but it sure does make for a funny video to look back on. Share this with your cat-loving friends by clicking the button below!